Traveling the NYS Thruway I-90, we are located at exits 47 (LeRoy), 48 (Batavia), and 48A (Pembroke.) Or drive our scenic "Country Byways" along State Routes 5 and 20. All roads lead to Genesee County! Routes 77, 98, 63 and 19 are all well maintained roads leading into our county. Traveling the 390 North from the Finger Lakes Region take Exit 7 (Mt. 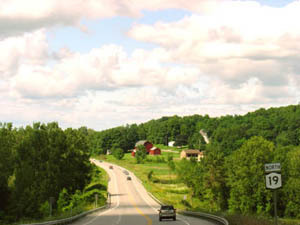 Morris) to Route 36 North, then to Route 63 North.